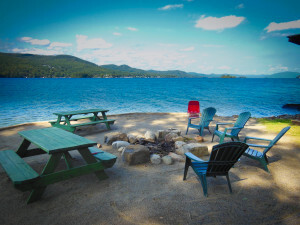 Our Lake George resort is located on the exclusive East Shore of Lake George. Antigua Resort on Plum Point affords a 10-mile lake view from over 700′ of pristine, tree lined shorefront. Warm afternoon sunshine, magnificent sunsets and picturesque grounds are the setting for a relaxing vacation on Lake George where outstanding lake views are available from all of our units and suites. Enjoy warm summer days and balmy nights on our private sandy beach. Our historic setting is where kids can be kids (and adults can be kids!) with a swimming raft, rowboats and canoes, and all sorts of resort activities. Roast marshmallows while meeting new friends at our lakeside campfire. Kick back and enjoy fabulous views from our gazebo on the point, or fish right off the deep side of our boathouse and docks. Our unique Lake George accommodations include several types of units, including, even a 2-bedroom boathouse. All units are fully equipped, from kitchens to linens, making this the perfect summer vacation resort! We are located on the quiet eastern shore of Lake George, only 2 miles north and minutes away from all that Lake George Village and the Adirondack region have to offer: shopping, fine restaurants, boating, and an endless variety of attractions. Check availability online and call 518-668-2556 to make a personal reservation at our Lake George resort on the East shore. We look forward to seeing you!